Rewards Canada: Air France KLM 3,000 Flying Blue miles sign up bonus for Canadians returns! 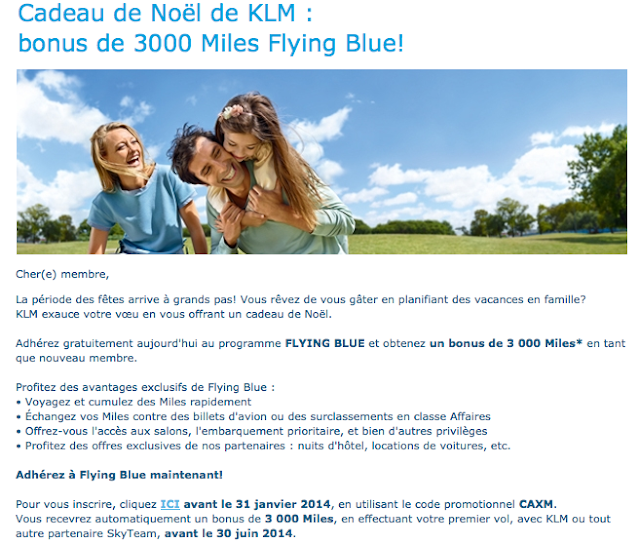 Air France KLM 3,000 Flying Blue miles sign up bonus for Canadians returns! Today sees the return of the Canadian Air France KLM first flight bonus when you join their Flying Blue program that we saw this past summer. This is a duplicate of the summer offer and as such is unlike most other AF KLM sign up bonuses as this one is not limited to AF KLM flights but is open to any SkyTeam flight! So you can fly Delta, Korean, Czech Airlines, or any other SkyTeam airline to earn this bonus. Can't make use of this promotion? Be sure to visit our Flying Blue Bonus Miles page for other flight, hotel, car rental and other mileage bonuses!